BarterQuest Blog » Tight Budget? Barter! As much as solo parents face emotional problems dealing with the absence of Dad (or Mom, if the solo parent is a widowed or custodial father), not all problems that challenge solo parents are of the interpersonal variety. Some are practical…like the shortage of funds that is frequently more severe in a one-parent family. These days it seems that everyone is feeling the pinch…but, as usual, the problem tends to be more severe when there is only one wage-earner, and especially when she needs to also pay for child care while she’s out earning those precious dollars. But even if your kids are old enough that you don’t need daycare or after-school care for them, money is likely still an issue. 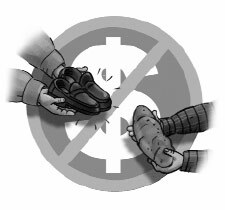 An old-fashioned approach to this problem still is very valid in today’s society: barter. And it solves not only financial issues but other issues as well, such as a shortage of time or talents. Shortage of time? Yes. Suppose you feel you don’t have the time to clean the house thoroughly every week and work 9-to-5 and help the kids with their homework and cook nutritious meals and balance the checkbook and pay the bills and spend at least a little quality time with the kids…never even mind having some “me-time” just for yourself? What if you could get someone to clean the house for you? Or cook dinners? Again, money figures into the equation: Most any service is available for those well-heeled enough to pay for it, but you may not be related to Donald Trump or have access to Warren Buffet’s wallet. You can barter for the services you need. Is there something you can do, create, or otherwise trade for the services of someone who can in return clean the house or make dinners for you? Now, of course it’s likely to take some of your time to perform the service you’re trading, but maybe that will take place at a more convenient time for you. Maybe it’s not that you lack time altogether to do the task you’re looking for help with. Maybe you just don’t have time to make dinner when you first get home from work, if the kids are little and you want them to be in bed early, but you have time later in the evening during which you could do some sewing on your machine for a friend in trade for her delivering prepared home-cooked dinners for you five days a week. Or maybe your workday ends at 3 PM and you could watch the kids after school for another friend, along with your own kids, in trade for her cleaning your house thoroughly on Saturdays while you go out grocery-shopping and doing errands. Shortage of talents? Yes. Maybe your problem isn’t a shortage of time so much as a lack of skills at sewing the kids’ clothes, painting the house, grooming the dog, or doing some other task. Again, these are skills that can be hired if you have ample money at your disposal, but these days few of us do, especially solo parents. So rather than strain the budget, botch the job doing it yourself, or go without, see if you can barter. How do you find a bartering partner? Start with the people you know. Who among your friends or acquaintances can create or repair those clothes, clean your house, install that new garbage disposal, paint your living room, groom your dog, or perform whatever other task you need? Be ready with an offer of your own in return: What can you offer to make or do for this other person? Have several suggestions in mind in case the first one is rejected. The person you tap to barter with may be amenable to a bartering arrangement in principle but not in need of the first thing you suggest trading for. If Sonja is willing to clean out your garage but doesn’t want an apple cake every week for four weeks in return, what else can you offer her in trade? Can you tutor her son in math? Can you help her write her résumé if she’s seeking a better job? If none of your friends or acquaintances is interested in bartering or is able to provide the specific service you need, enlarge your scope. Try advertising on CraigsList, on a community bulletin board (literal or online), using word of mouth (asking friends and acquaintances whom they know who might be able to provide the needed service), or you might even consider setting up a barter exchange organization in your community and becoming your own first client. Too, if the service you want to have performed for you is something that might be performed by a business owned by a sole proprietor, try approaching the business owner with a bartering proposition. If a company is a Megacorp-type with a board of directors and stockholders (public or privately held), forget about it. But remember, some corporations and LLCs are simply legal protection sheltering a sole owner or, perhaps, a pair of partners or a mom-and-pop operation. So don’t let the fact that Pete’s Plumbing is owned by Plumbing Specialists, Inc. dissuade you from making your proposition to them. The sole stockowners in Plumbing Specialists, Inc. might be Pete and his partner or Pete and his wife…or just Pete himself. In this tight economy, Pete’s Plumbing, Housepainters Deluxe, and various other service providers are likely struggling to make their own ends meet, and while they’d love a cash-paying customer, if you can provide a service (or item) in return for their services, and it’s one they want or need, they may be very happy to be able to get it without a cash outlay. Can you design or write advertising materials for them, clean their offices, write a commercial jingle, or provide any other service for their business (or possibly for their home), in return for their doing some work for you? I have heard from more than one person whose father was a doctor in “the old days” and accepted chickens or slabs of bacon in payment for their fees. While it’s rare anymore to find a physician who’ll barter his or her professional service for other services, let alone for food, many other types of service providers may be agreeable to that kind of arrangement. Bartering—it’s an idea from the past whose time has come again, and it can be a particular boon to the solo parent with just one household income and one set of skills (yours) in the home. Try it.